Now that 2011 is just about on its way out, we wanted to take a moment to look back on some of our projects, preoccupations and ongoing initiatives- to take stock, as it were- of where VisionArc has been in the last 12 months or so, and where we hope to be going in 2012. In the last year we have been witness to all sort of major shifts in the social, environmental and political orders of the world. At the outset of the year a tide of sweeping social and political change erupted in the Middle East, shifting long standing regimes towards more inclusive and democratic models. On March 11th, Japan experienced a devastating natural disaster, bringing the lives of tens of thousands of Japanese people to a halt while also shifting the entire global discussion about energy production. And in the fall, a small demonstration in a park in New York City gave birth to a global movement demanding broad shifts and reforms towards equal social and economic distribution. While geographically disparate, these events, and many others, reflect a global present defined as much by large scale shifts in dominant orders as by the systemic interconnections that make them shared challenges and just far off news items. While challenges like energy and food consumption are defining the decades ahead, new tools for linking individual behavior to collective risks will be an increasingly important nexus for social and design innovation. This past March, in the aftermath of the Japanese earthquake and tsunami and the events at the Fukushima nuclear power plant, VisionArc and the World Economic Forum Global Agenda Council on Design studied a concept called Teiden Kensaku. In it we proposed a social networking platform to create a feedback system, connecting daily energy consumption to its larger consequences at the regional and national scale. With half the planet now living in cities, the requirement for new modes of social and urban resilience is creating a need to redesign the civic function of everyday practices like running a business, locating resources, and engaging citizens. This Fall, VisionArc launched a long-term initiative as part of a public workshop entitled Confronting Comfort: Visual Systems at the BMW Guggenheim Lab in New York. The workshop engaged participants in identifying “soft systems” in the city, such as small businesses, and social resources that represent powerful, bottom-up mechanisms for confronting shared challenges. We’re now in the process of extending this initiative towards creating programs that focus on specific neighborhoods and communities throughout New York City. To confront the interrelated challenges of the 21st century, collective problem solving will require new frameworks that replace ‘silos of expertise’ with ‘platforms for connecting’ – linking the broadest spectrum of thought leaders. 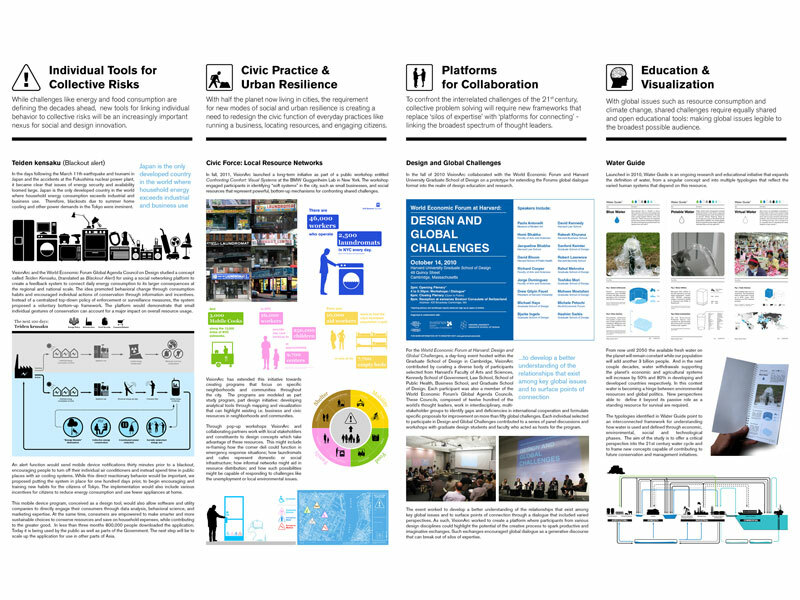 Last fall of VisionArc collaborated with the World Economic Forum and Harvard University Graduate School of Design on a prototype for extending the Forums global dialogue format into the realm of design education and research. Design and Global Challenges: The World Economic Forum at Harvard worked to develop a better understanding of the relationships that exist among key global issues and to surface points of connection through a dialogue that included varied perspectives. With global issues such as resource consumption and climate change, shared challenges require equally shared and open educational tools: making global issues legible to the broadest possible audience. Last Fall Visionarc launched an ongoing research and educational initiative called Water Guide. The study seeks to expand the definition of water, from a singular concept, into multiple typologies that reflect the varied human systems that depend on this resource. It seeks to offer a critical perspective into the 21st century water cycle by framing new concepts capable of contributing to future conservation and management initiatives. 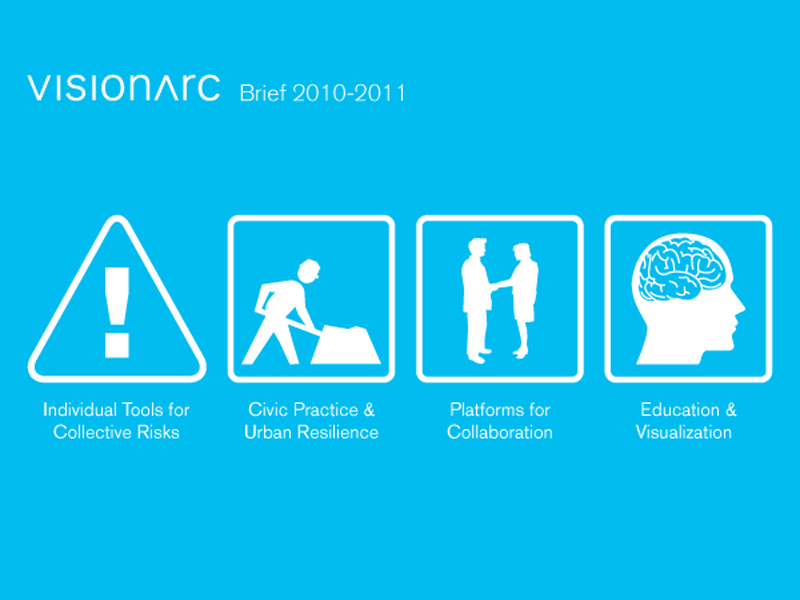 These are a few of the past and ongoing projects that made up VisionArc’s 2010-2011 year. We’ll be continuing to develop some of them throughout this next year and beyond. We’ll keep you posted. We’re always excited to hear thoughts from out there in the world so if you have any feel free to drop us a line. One last thing: if you’d like us to send you either a hard copy or a downloadable .pdf of our 2010-2011 brief send us an email by visiting our contact page. Please include your name and preferred format. We’ll send you out a nice looking fold-out for you to read on the subway, on the front porch or wherever you feel so inspired.